This challenge is an opportunity to explore the inspirational, adventurous, independent side of South American culture – and to be paid to have your photos featured in an international marketing campaign for luxury leather goods brand pampeano. Please note that each member can enter a maximum of three photos to this challenge. Whatever the subject, images should inspire the viewer, suggesting an attractive, independent lifestyle. To complement their branding, pampeano are particularly interested in photos that use natural colours and light. Landscapes should include people, or clear references to South American culture and history. Famous landmarks should also be avoided (e.g. Machu Picchu, Christ the Redeemer). In addition to prizes for the winning images chosen by the expert judge and the crowd vote, any images used by pampeano in their marketing will earn their owners a beautiful hand-woven pampeano belt, embossed with your own initials, worth £90. Please note: submitting a shot to the challenge is considered acceptance by the photographer that their image can be chosen for use by pampeano in their marketing. For those images they choose, pampeano will be granted a global, non-exclusive, in perpetuity, royalty-free license. Images featuring identifiable people can only be used for marketing if a model release has been signed by each of those identifiable people, and we’ll contact you to clarify this if your image is chosen. If an image does not have the required model releases it can still however be entered into the challenge for inclusion in the crowd and expert vote. The winner of the crowd vote, the winner of the expert vote, and the owners of any images chosen for use by pampeano will get a beautiful pampeano belt for each image used. 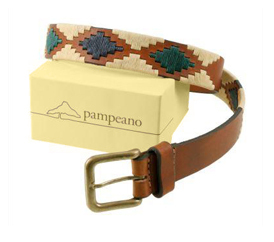 The belts can be chosen from pampeano’s extensive range of hand-crafted belts, viewable here, and will be embossed with the prize winner’s initials. Each belt is worth approximately £90 once embossed and may be shipped internationally.